Your child will have a blast zooming around on their Mocka Ride on Ladybird. For the cutest set of wheels around, this makes a great first ride-on toy for those new to walking. 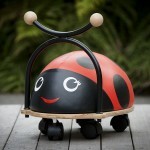 With a padded vinyl body and nylon castor wheels, the Ride on Ladybird is sure to be a winner! For cuteness overload, this set of wheels features a bright and friendly design which is sure to win over any boy or girl.